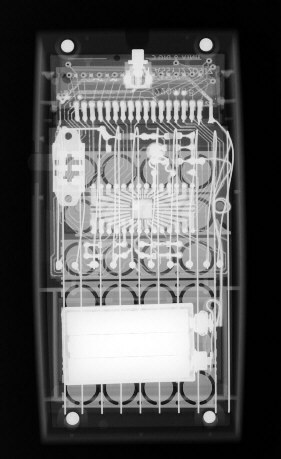 Ever thought about the unvisible parts of your electronic calculator ? 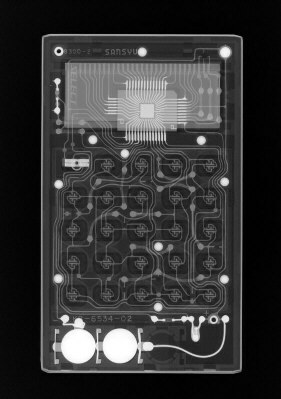 Edward Soudentas took some vintage calculators onto the X-ray machine and gives us unbelievable views of early technology. The Datamath Calculator Museum provides you 4 different calculators manufactured and sold by Texas Instruments and gives you additional views of the whole calculator and the printed circuit board. 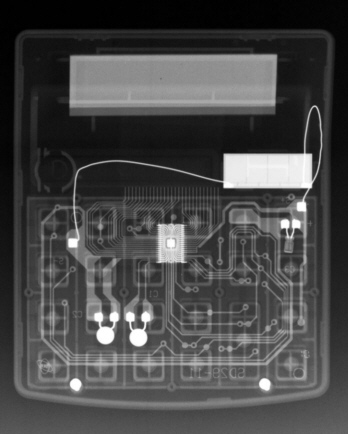 All the X-ray pictures could be found unaltered on Edwards wonderful website www.petergof.com. Please follow the x-ray link. 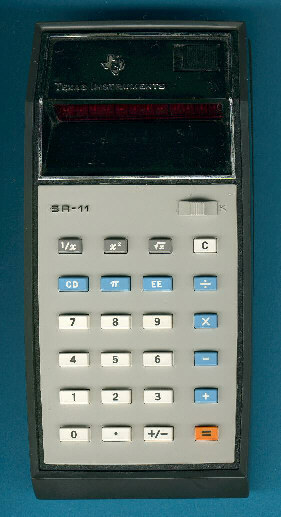 The SR-11 was introduced September, 1973 as the successor of the SR-10 scientific calculator. It uses 3 AA-sized NiCd-batteries and a 12-digit LED display. You'll easily locate the 28-pin TMS0602 calculator IC surrounded by 4 display drivers. The 3 batteries are located under the LED display. 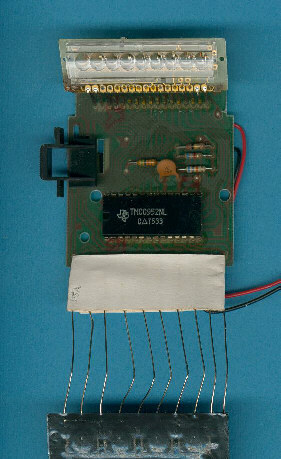 This picture without the batteries shows the small display board and all the tiny components necessary in an early TI calculator. Note: This is a rear view. 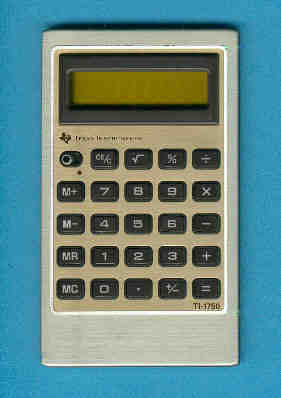 The TI-1250 was introduced June, 1975 as the first one-chip calculator. Together with it's sibblings millions of this design were sold. You'll easily locate the 28-pin TMS0952 calculator IC. 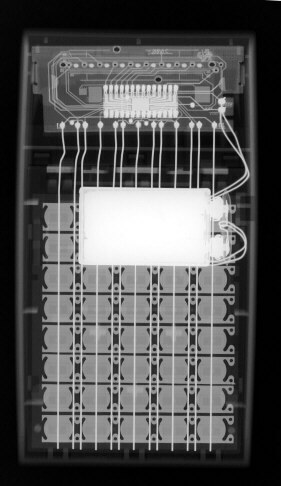 This picture gives you an idea of the keyboard with the small metal-domes pressed against wires. Not too much components on the printed circuit board! 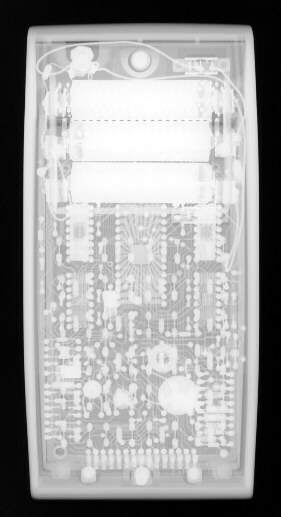 The 9-digit LED-stick is located on top, the metal-domes of the keyboard are hidden under the black foil. 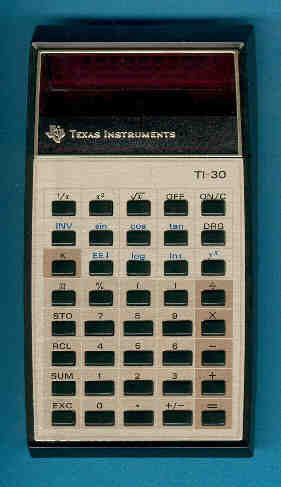 The TI-30 was introduced June, 1976 as the first scientific one-chip calculator. It was probably the best selling calculator ever. You'll easily locate the 28-pin TMC0981 calculator IC. This picture gives you a perfect view of the x/y-matrix keyboard with the small metal-domes (x-line) pressed against wires (y-line). 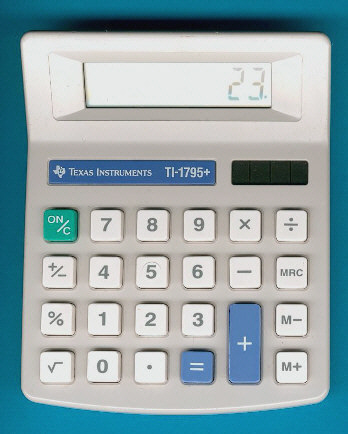 The TI-1250 uses a small printed circuit board to accommodate the display, the TI-30 integrated even the calculator chip on the display board! 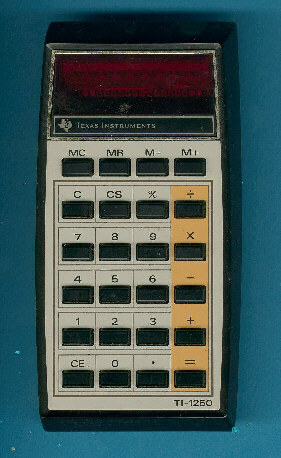 With the TI-1750 Texas Instruments entered April, 1977 the market of LCD-calculators. Note: Design and manufacturing was done in Japan. 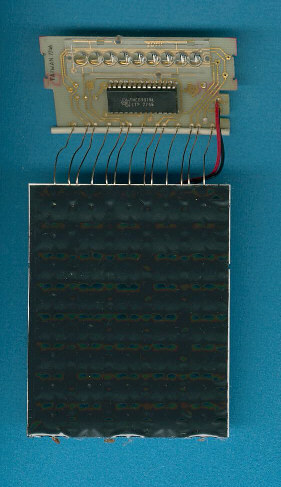 The 44-pin Quad-Flatpack calculator IC manufactured by Toshiba is located under the EPSON manufactured yellow-LC display. The calculator runs more than 3000 hours from 2 little coin batteries. 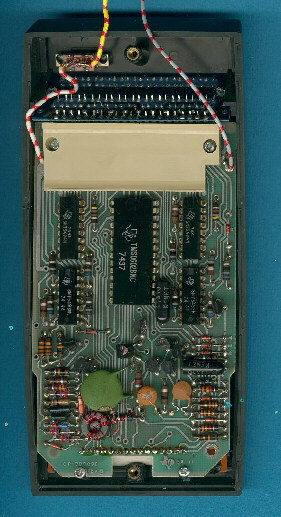 Two interesting items on this printed circuit board: It is one sided with thick "bridges" to give a second layer of connections. The keyboards consists of small conductive pieces pressed against the metal-fingers on the board. The TI-1795+ traced back to the original TI-1795 introduced already in 1984 and the basic design was available as TI-1795SV till 2002. 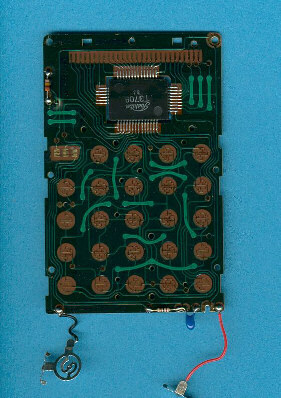 This late TI-1795+ was manufactured in 1996 and makes still use of a conventional housed integrated circuit for the calculator brain. Please notice the empty battery compartment on the left side of the housing. © Edward Soudentas (X-RAY pictures) and Joerg Woerner, February 22, 2001. No reprints without written permission.